Never miss an opportunity to show the one you love how you feel. Don't just say it. Live it. This isn't a quote, but it is the best advice you can ever be given. Happy Valentine’s Day 2014! Don’t wash away in the rain. At least it’s not snowing a blizzard, which is supposed to come on Tuesday - maybe. I suppose, what should we expect in the middle of February? At least today you can make it to the grocery store to buy all the fixings for a wonderful romantic dinner with the one you love. But don’t buy bread. If you mix this before you go out the door for work, you can deal with it when you get home. You’ll then have a beautiful loaf to serve with your dinner, candles and good bottle of red wine. You are having a good bottle of red wine, yes? Before first rise; after six hours. 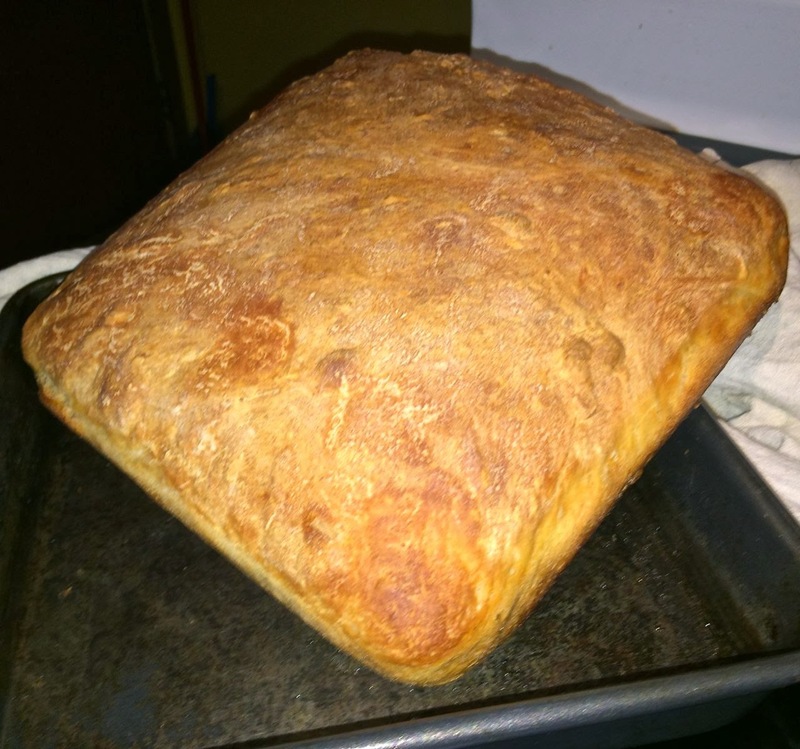 This loaf has a crisp crust and moist, airy interior. Hole-y, but not too hole-y, so butter won’t drip down your arm. I made this a few days ago, and I can vouch for its delicious flavour when still warm, as well as used for toast in the morning. It makes great toast. It would make a great sandwich, too. 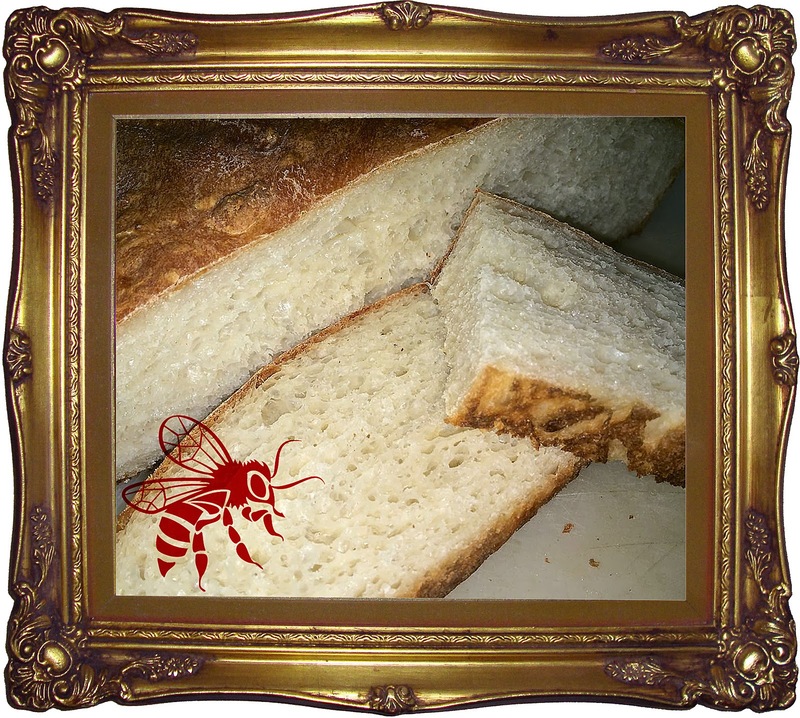 So if you’re a little afraid a whole loaf won’t get used, put those fears to rest. It will be gone before you realize it, much like Valentine’s Day. So make the most of it. Show that special someone how very special they are - however that may be. Mix all the ingredients together in a large bowl. Beat with a spoon for about 3 minutes to mix well. Cover with plastic wrap and a tea towel, place out of direct draughts, and let rise for at least six hours. The dough will more than double in size and be very “wiggly.” It will look like you will never be able to work it. This is normal. Oil a 9” x 9” x 2” square baking pan. 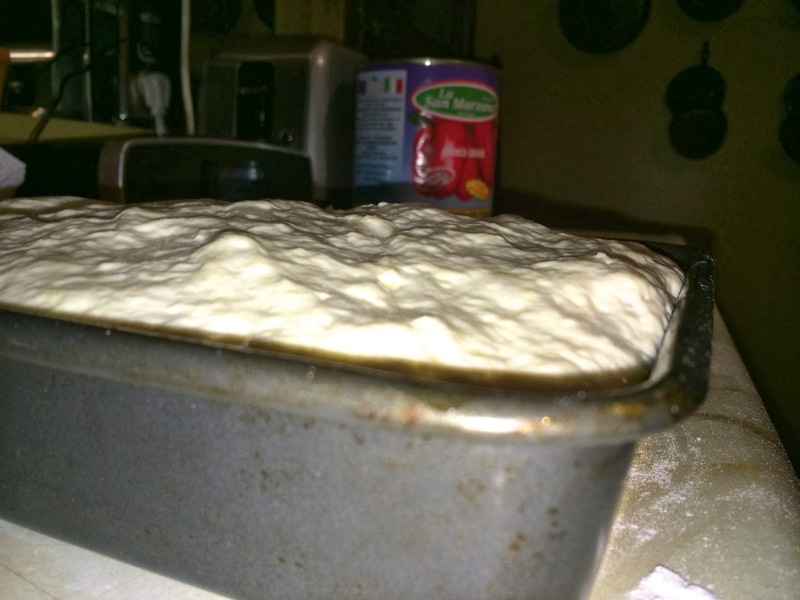 “Pour” the dough out onto a floured surface. Using a dough scraper, fold it over onto itself several times. Use only enough flour to keep it from sticking. It will start to retain a bit of shape. Plop the dough (yes, plop) into the prepared pan. Using oiled hands, level it out in the pan as best as you can. Let rise again until the dough comes to the top of the pan. This may take 1 to 1.5 hours. Preheat the oven to 425°F. * Bake the risen loaf in the oven for 35 minutes until it is nicely browned and sounds hollow when tapped on top. Let cool slightly, remove from the pan and place on a rack to finish cooling. * For some additional loft, place a pan of water in the oven while it is heating. Remove it just before baking.